Here is another one of our fabulous clients M Communications Inc. and M Com Publishing clients. Warning: … do not read the following with you are hungry! Maria Vieages is not your everyday culinary chef by any means. As a private chef, her company not only inspires food aficionados, but she truly creates unique menus that reflect her upbringing in New Orleans, combined with a trendy Sonoma Wine Country flair. A couple of her signature dishes include Pan-Seared Diver Scallops with Sweet Corn and Prosciutto, Fire-Flashed Double-Cut Lamb Chop with Port Syrup, Sauce Vierge and Garlic Confit, and Butterscotch Pot du Crème, to name a few. In addition, Maria cooks for private parties where guests can enjoy a gourmet multi-course meal and the host/hostess will appreciate being able to enjoy the party without the hassle of cooking or cleaning up. Lastly, Maria’s talent clearly speaks for itself and her clientele list includes Dan Rather (ongoing), Pink and the production team of The Real Housewives of New Jersey. Maria Vieages is currently working on a project with the Oprah Winfrey Network, and was the private chef on HGTV’s House Hunters on Vacation (The Wine Country Episode). She also recently made an appearance on the Hallmark Channel where she cooked for the talent. Maria’s story is nothing short of sensational. At the age of 30, after earning a degree in radiology, she decided to follow her passion for cooking that landed her at the Delgado School of Culinary Arts, where she chose apprenticeships at The Hotel Intercontinental and The Fairmont/Waldorf Astoria, both located in New Orleans and finished her studies with Chef Emeril Lagasse, also in New Orleans. In 1997, Maria Vieages branched out even further and due to her talent; she opened a small café with catering services, and she grew her business to 42 employees. However, in the wake of Hurricane Katrina, she lost her restaurant and her home. 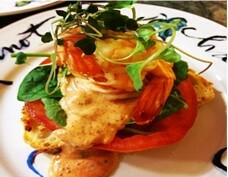 Maria Vieages offers a variety of exquisite menu options with a New Orleans, Portuguese, and Sicilian flair. She offers unique, customized menus for her clients. In addition, Maria Vieages offers private cooking classes and is a guest chef on Celebrity Cruises, where she teaches, provides cooking demos, and even headed one of the first passenger culinary chef challenges on the high seas. For more information on teaching or private cooking services (at home or even by jet or cruise), please visit: http://www.realmaria.com.